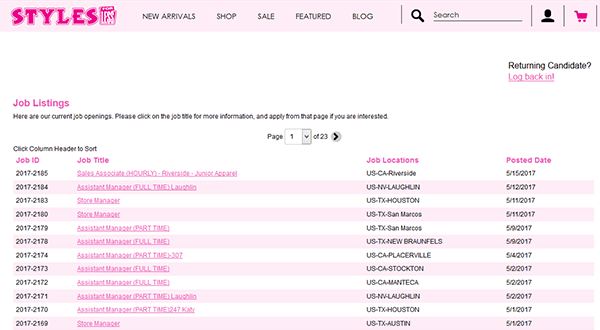 The Styles For Less job application is available via the company’s careers page. Use the links posted on this page to access the main careers page, search for jobs, and submit applications. Numerous types of jobs can be searched and applied for including retail, management, corporate, support, and distribution positions. About the company: Styles For Less is an American clothing retailer headquartered out of Anaheim, California. The company was formed in 1992, and currently operates over 160 locations throughout the United States. Note: The above link will take you directly to the company’s main job search page. Step 2 – Once on the main job search page enter a keyword into the input field, or select a location/job category from the drop-down lists. Step 3 – Press the “Search” button to load the results. 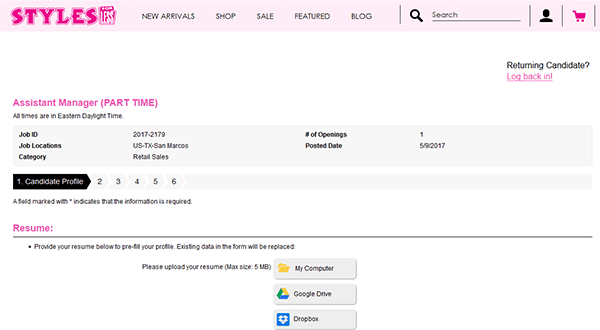 Step 4 – The listings can be ordered by job ID, job title, location, or posted date. Press the link of the job that you want to submit an application for to load the next step. Step 5 – Press the button as outlined below. 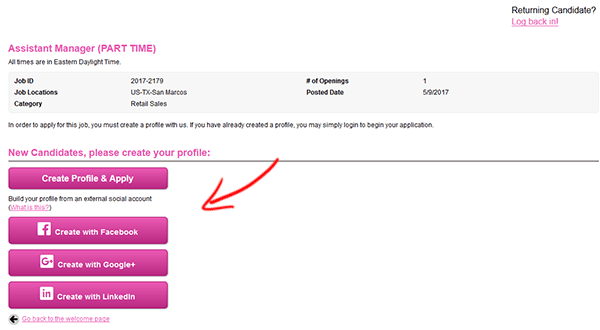 Step 6 – Click the “Create Profile” button. Step 9 – After all of the sections have been fully completed you will be able to submit your application. Note: Applications typically take around 1-2 weeks to process (this is an estimate).